Most cases of kidney infections in birds remain undetected because the symptoms - wet droppings - are confused with diarrhoea. If a bird's droppings are totally wet and mainly consist of a whitish to yellowish liquid, something may be wrong with the kidney. Does the bird look sick overall, it is most likely that his internal organ is affected by some kind of disease. 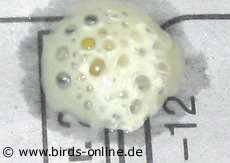 On the right, you can see the urine of a budgie who suffered from a severe kidney infection, a so-called nephritis. But why are kidney diseases so often confused with diarrhoea? The reason is simple: The bird's alimentary system is completely different from ours. 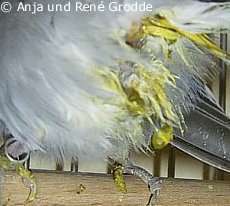 Birds only have one orifice of the body from which both, faeces and urine, are released. If the droppings that normally consist of both elements are too wet, people tend to compare this with the human digestion and think of diarrhoea. But in birds, the droppings also get wet in case the amount of urine increases. In normal droppings, the urine portion is creamy white and solid, see photo on the right. Sometimes birds drink a lot of water, for example when they take a bath . Also after eating larger amounts of fresh food like cucumber, apple or melon wet droppings can occur for about one hour. It's the same in humans: After we enjoyed a large piece of water melon or cucumber salad, we should not move away too far from the next restroom... The photo on the right shows a wet dropping of a budgie who had some water melon before. 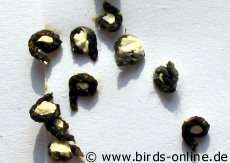 If you see such wet droppings, please check out whether your bird ate a lot of fresh food or not. After eating juicy fresh food, wet droppings are normal and in general they do not indicate a kidney problem. After about one hour the droppings should look like they usually do and they shouldn't be that wet any more. You most probably have to deal with a kidney problem if the droppings remain this wet for more than an hour or if your bird didn't take a bath or have a lot of fresh food. And also birds who suffer from kidney infections get very thirsty, so they drink more water all day long than they usually do. 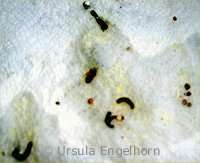 In extreme cases, the droppings do not contain any solid parts (faeces) at all and they just consist of urine. As you observe this in your bird, you should take your little feathered patient to an avian vet as soon as possible. Acting fast is very important, because birds suffering from a kidney infection tend to dehydrate (dry up) because of the constant loss of body fluid (urine). Please note that from time to time a budgie who is upset can also show very wet droppings for about half an hour. In sick birds, the plumage covering the cloaca gets wet, sticky and dirty due to the wet droppings. Since the feathers are damp for a longer time, they change their colour to yellowish or greenish (see photo on the right). And you can also detect the infection with the help of your nose, because the plumage starts to smell bad. The urine odor gets stronger the longer the infection lasts. In addition to this, the urine irritates the skin around the cloaca and many birds suffer from itchiness. Some pick their own feathers due to the unpleasant sensation. A kidney infection and the so-called polyuria can be caused by several different things. Quite often, mistakes in the daily diet can cause these problems. In case a bird gets seeds and grains that are too oily and that contain too much proteins, in the long term the kidneys will get damaged. Also human food can cause a kidney problem: Birds who nibble salty human food stuff poison themselves with the far too large amount of salt what leads to a deadly kidney failure in the worst case. Another cause can be a problem with the drinking water. If there is too little water or if it tastes different (due to a food supplement for example), birds don't drink enough. The organism needs water; a lack of water can harm the kidneys. Once damaged due to any reason, the organs can easily become affected by bacteria what leads to an infection. Some toxic substances can also damage the kidneys. And some medical drugs create adverse reactions affecting the kidneys. Please also keep in mind that some food supplements for budgies are not suitable for ill birds suffering from nephritis. You have to talk to your avian vet about your bird's diet. The doctor will also tell you whether a special food supplement is harmless for nephritis patients or not. Even though a bird keeper can try to observe the animals carefully, only a vet can diagnose a kidney infection. 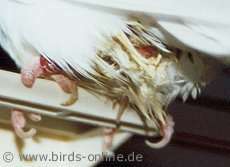 Regrettably many birds die due to such diseases because they are often hard to cure. If the nephritis has already become chronic, you can only hope to achieve abatement but no complete healing. Such patients need enough drinking water each day and you should make sure they find clean water. Some birds who suffer from a chronic kidney disease are not allowed to eat protein-containing food or too much fresh food. Therefore you should discuss the individual daily diet of your bird with your vet. This powder can be stirred in one litre of distilled water. The solution should be mixed in a bottle and stored in the fridge. It stays fresh for about three days. Most vets recommend a therapy that lasts ten days. Therefore you should mix a quater of the powder with just 250 ml water and use the solution in three days and after that mix another portion and so on. If your bird doesn't like the taste of the tyrode solution, maybe he won't drink it. You have to make sure he drinks enough and therefore you should give him plain water in case he refuses to drink the salt solution. The tyrode solution should then be given directly into the beak three to four times a day (just a few drops each time).